I wish I would have come up with this recipe sooner. Like 3 years sooner. 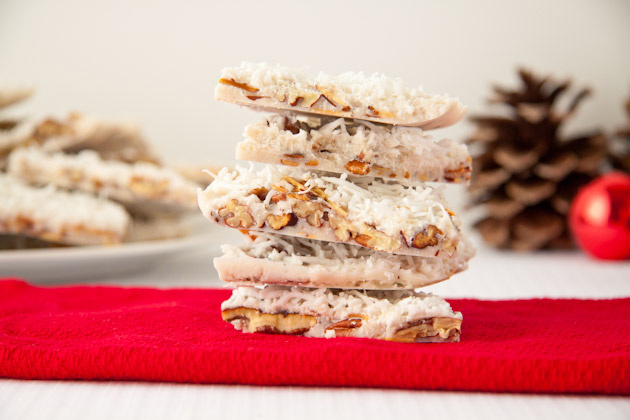 If you like coconut, you’re going to LOVE this bark. 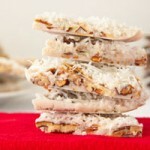 If you don’t like coconut, I suggest you make a batch of chai spice roasted almonds and forget this post ever existed. 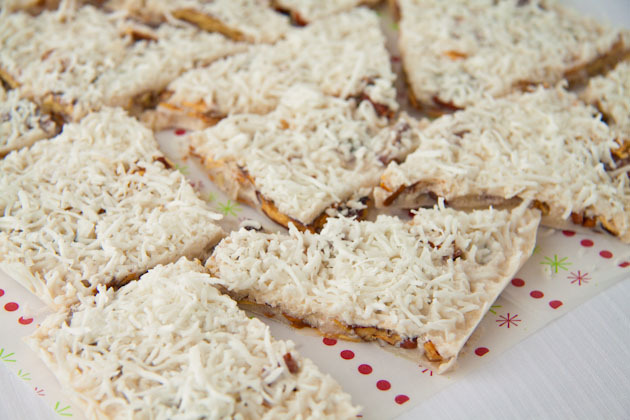 Sure, you could make these for people as a nice Christmas present. 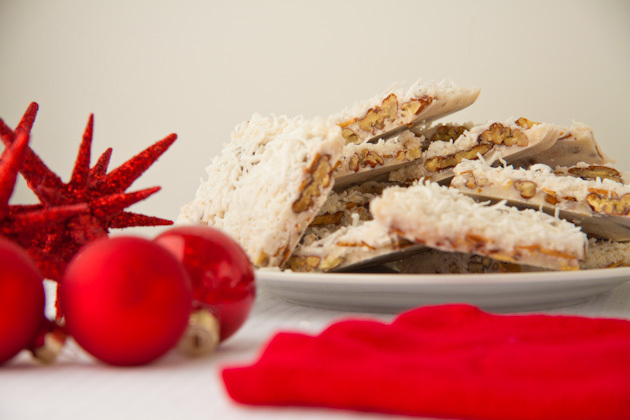 Wrap them up in a nice box and wow your friends… Or you could make it for yourself and snack on it for the next 16 days! I went for the latter of the two, obviously. But I took a picture of the bark in a nice box just so you could see what a nice gift it could be. Pretty, no? Prettier in my belly if you ask me! I kid, I kid. But not really. 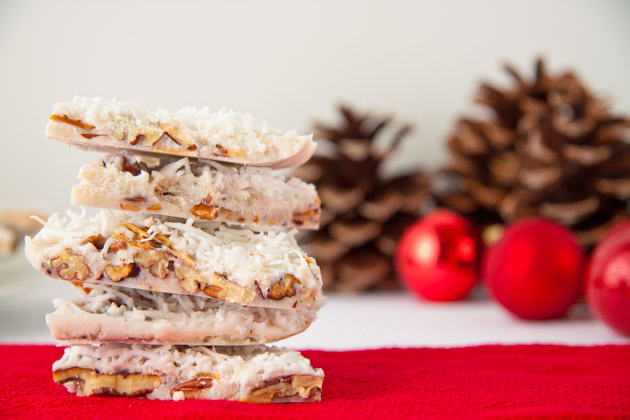 This bark makes for a great filling evening snack that will satisfy the sweetest tooth you got… naturally. 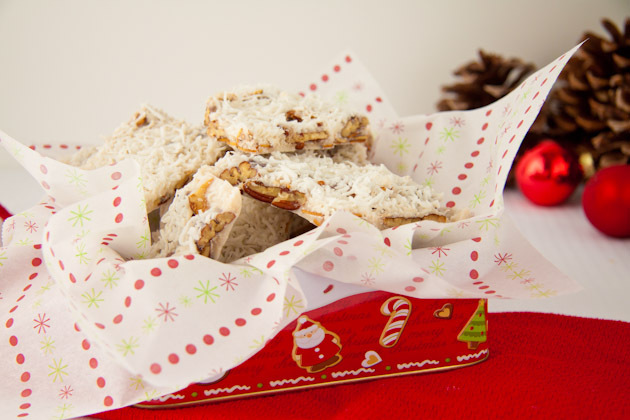 Go primal this Christmas with a hearty bark made with simple, sugar-free, whole food ingredients. heat 2 teaspoon coconut oil in a cast iron pan on medium heat. Add almond slivers and pecans. Reduce heat to medium-low and toast for 2-3 minutes, rotating frequently (about every 20 seconds) to prevent from burning. Remove from heat and sprinkle with Himalayan rock salt. Set aside. 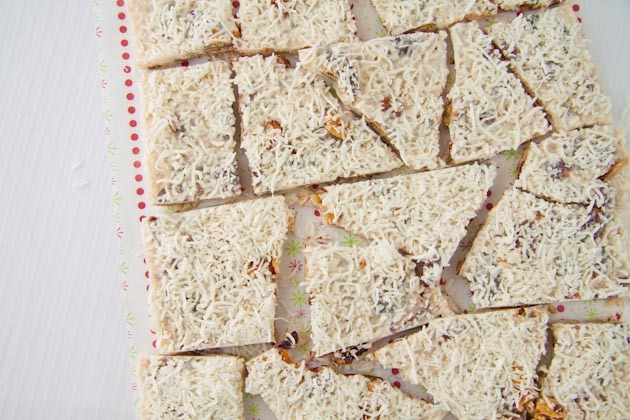 How does a sugar-free bark satisfy your sweet cravings, you ask? Well, the #1 way to permanently satisfy your sweet cravings is to opt for foods high in fat and protein; something that this lovely bark has lots of! When you have a sugary treat (think high fructose corn syrup, white sugar, cane sugar), your blood sugar goes up, then down, followed by another craving for sugars to elevate it again. It’s a viscous cycle. You can successfully stop the craving with a whole food like nuts. They are high in protein, fats, and have a limited amount of carbohydrates. The carbs will satisfy your sweet tooth but wont boost your blood sugar, and the protein and fats will keep you fuller, longer. 2 hours later and you’ll be happy you enjoyed a healthy treat; and even happier that you’re not heading for seconds of the high sugary food you would have had. It’s a win, win, really! How do you satisfy your sweet tooth in a healthy way?